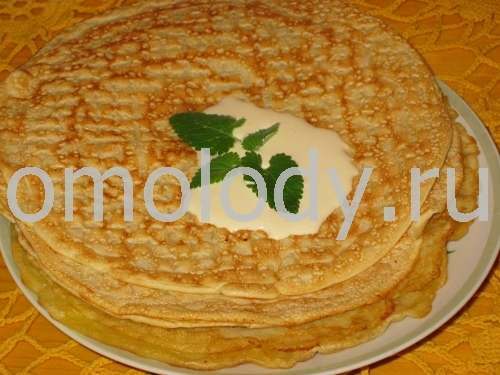 Blini - Millet and flour pancakes. 20 grams (1 oz) fresh yeast. 100 grams (3,5 oz) butter. 1. Dissolve fresh yeast in warm milk. Add flour and mix. Leave the batter covered with tea towel to stand for 1 - 1,5 hours in a warm place. 2. Heat 6 cups of milk. Put into boiling milk washed millet and cook until tender. Chill. Add in to millet eggs yolks, beaten with sugar and salt. Mix. Add the millet mixture into raised (flour) batter and mix. 3. Leave the millet - flour batter covered with tea towel to stand for 1 - 1,5 hours in a warm place, and when it has risen, add gradually whipped egg whites and stir. In 15 - 20 minutes batter is ready to cook the millet - flour blini. 4. Heat frying-pan with a long handle, rub with oil, pour in some batter and swirl the pan lightly to spread it evenly. When one side is cooked, turn the blini over and cook the other side. Repeat with the remaining batter, add oil into frying-pan as needed.